The LDIFDE utility exports and imports objects from and to Active Directory using the ldif format, which is kinda’ like csv when it gets really drunk and can’t stay on one line. Luckily, ldif can’t drive. Actually, each attribute/field is on a line (which allows for arrays) and an empty line starts the next record. Which can make for a pretty messy looking file the first time you look at one. The csvde command can be used to export data into the csv format instead. In it’s simplest form the ldifde command can be used to export AD objects just using a -f option to specify the location (the working directory that we’re running the ldifde command from if using powershell to do so or remove .\ if using a standard command prompt): ldifde -f .\ADExport.ldf This exports all attributes of all objects, which overlap with many in a target Active Directory and so can’t be imported. Therefore, you have to limit the scope of what you’re exporting, which you can do in a few ways. The first is to only export a given OU. To limit, you’ll define a dn with a -d flag followed by the actual dn of the OU you’re exporting and then you’d add a -p for subtree. In the following example we’ll export all of the objects from the sales OU to the SalesOUExport.ldf file: ldifde -d "OU=sales,DC=krypted,DC=local" -p subtree -f .\SalesOUExport.ldf Restoring objects still results in an error that the server is “Unwilling To Perform” the import because “The modification was not permitted for security reasons.” Basically, this just means “hey I’m not going to import into some of the fields that I know I have to reserve for objects managed by the system, such as creation date (whencreated), last changed date (whenchanged), etc. So we can take some of these and omit them from our export. You can use ADMT or just look at an ldif or csv file to determine which attributes from the schema that you think need to be omitted, but at a minimum it should include objectguid, uSNCreated, uSNChanged, whencreated and when changed (and a lot of the Exchange attributes if you’ve extended the schema for your forest). To omit use the -o and enclose the omitted attributes in parenthesis. In the following example, we’ll export to the SalesOUExportO.ldf file, and add the -o flag to the previous command: ldifde -d "OU=sales,DC=krypted,DC=local" -p subtree -o "objectguid,uSNCreated,uSNChanged,whencreated,whenchanged" -f .\SalesOUExportO.ldf You can also omit using the -m flag, which includes only the essential attributes, so we’ll add that to the command as well: ldifde -d "OU=sales,DC=krypted,DC=local" -p subtree -o "objectguid,uSNCreated,uSNChanged,whencreated,whenchanged" -m -f .\SalesOUExportO.ldf Use the -l option to limit the attributes being exported to only those specified. The -r option restricts the export to a given category or class. For example, if we only wanted to export users, we can restrict to objectClass-User ldifde -d "OU=sales,DC=krypted,DC=local" -p subtree -r "(objectClass=user)" -o "objectguid,uSNCreated,uSNChanged,whencreated,whenchanged" -m -f .\SalesOUExportOM.ldf Now I’m feeling like we have a good restricted set of data that we’re moving. Let’s go ahead and give importing a shot on a target server. To do so, we’ll just use -i to specify this is an import, followed by -k to say “don’t stop if you have a problem with just one record”, -f to define a file and -j to write a log. We’ll use the working directory for the file path and the log path, assuming this is being done by calling the .exe from within powershell: ldifde -i -k -f .\SalesOUExportOM.ldf -j .\ Once complete, the exported objects should appear once you close and re-open Active Directory Users and Computers. You can also export one object, then programmatically create objects in an ldif file as needed by importing them into Active Directory using ldifde. You can destroy an LDAP server using the Server app (and still using slapconfig -destroyldapserver). 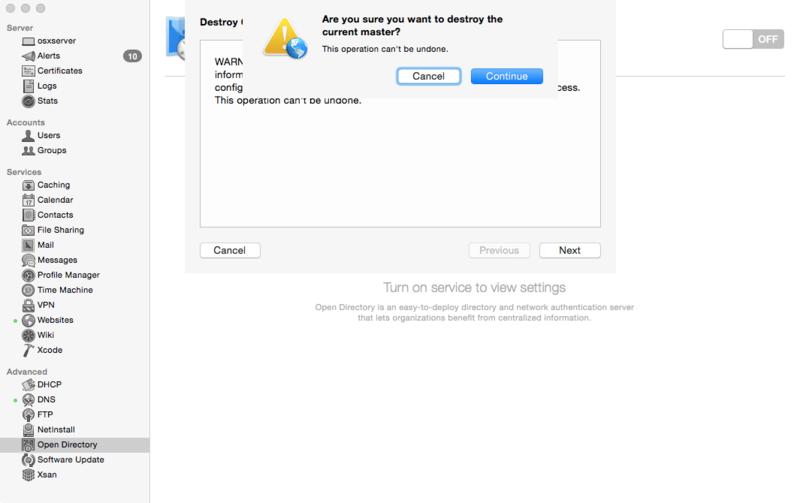 To do so, open the Server app and click on Open Directory. 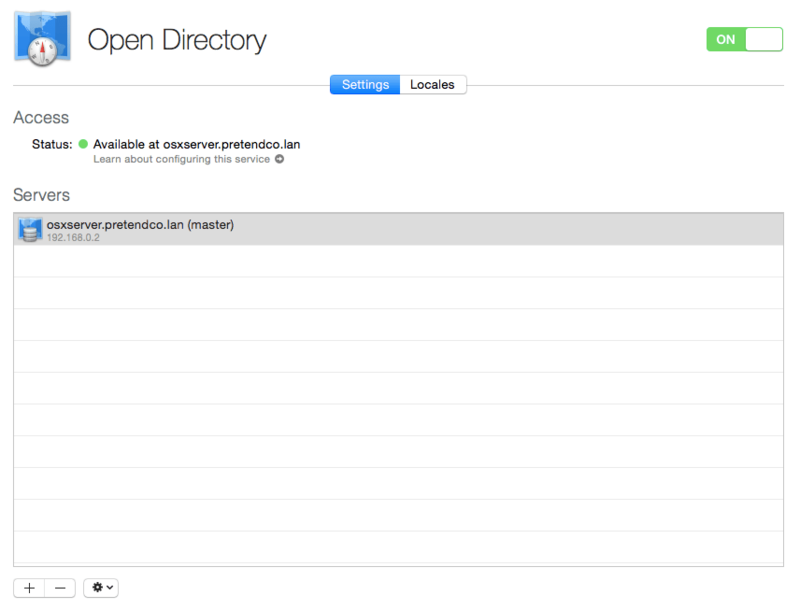 Then click on the Open Directory server in the list of servers. When prompted to destroy the LDAP Master, click on Next. When asked if you’re sure, click Continue. When asked if you’re really, really sure, click Destroy. Wait.